UPDATE 1/25/2017: I've noticed that if you use the second method (where you hot glue the strap onto the purse rather than threading the pipe cleaner through the actual purse on either side), the hot glue can lose it's hold. What's likely happening is that there's enough loose glitter that the whole shebang can peel off. If this happens, I would recommend using a nice generous dollop of E6000 between the purse and the hot glue blob. This is a pretty good strategy in general when you encounter hot glue appearing to "peel up" off one surface - the cooled hot glue blob will have conformed nicely to the surface to give you a good contact area and the E6000 is a little stronger but too runny to hold something big in place. I'll try to add some pictures of that process if I get a chance. A few days ago I posted a few pictures of some resin embellishments I've been working on over on my Instagram account, and have been getting a few requests for info on how I make them. I hadn't posted about resin previously because there are so many excellent YouTube videos from much more experienced resin crafters. I've been playing with resin for a smidge over a year and would say 50% I what I know comes from watching videos and 50% just comes from experimenting and playing around. There are a lot of options for kits, I use Easy Cast. I am led to believe that there are better/higher-end kits, but for what I'm doing I'm happy with Easy Cast. You can buy Easy Cast at Michael's, but I usually buy from Amazon. - I use disposable medicine cups for measuring the resin and hardener. Look for the term "graduated" when buying your cups - it's important that you use precise amounts - eyeballing is not exact enough! - Don't store or prepare your resin in a cold spot - keep it room temperature. In terms of molds, I occasionally use plastic molds (like this one), but mostly I use silicone. I love that they come in such crazy (and geeky) shapes. I use a lot of novelty ice cube and chocolate molds. Just remember once you use a mold for resin you can never go back to using them for food (though you can use for both resin and polymer clay). If you're new to resin, I'd recommend this plastic mold and this heart silicone mold as a starting point. If you fall in love with it, you can start building your collection. (I may share some pictures of my collection and details on where I buy molds in a later post). If you're really bananas (like moi) you can make your own silicone molds. The #1 tip I have for working with silicone molds is that glazing makes a huge difference. When you pop your pieces out of plastic molds designed for resin, they'll be nice and shiny and glassy. Typically, the silicon mold gives you a "matte" surface (I was disappointed by this the first couple of times until I learned to glaze). You'll sometimes hear the YouTube resin crafters refer to this as "doming." The next time I have a batch of resin mixed up, I take a small paintbrush and paint a thin layer of wet resin over the surface and let that cure. It takes a teeny amount to glaze, so I don't usually mix up a batch just for glazing. Protect your surfaces really really well for this - it's very hard to clean up spilled resin (if you try, I'd recommend using baby wipes or rubbing alcohol - not water!) and darn near impossible to get rid of cured resin. Be extra careful!!! I get my alphabet beads from Michael's. I don't use them much for shoes, but chunky glitters work really well for resin. Confetti (the shiny plastic kind, not the paper) is great too and I'm finding a little goes a very long way. For confetti I'm all about Chico Party - their selection is fabulous. Every time I visit that site, I find another dozen I have to talk myself out of ordering (why hellloooo there). I've also gotten foil confetti from Party City and Oriental Trading. I've continued to make these (even though they aren't as thematically appropriate) because they're so cute and I love having alternatives to glettering on hand when I have a shoe that doesn't have a good spot for traditional glettering. So there you have it - play around and let me know how it goes!! Happy glittering! When I was working on purses for my glitter workshops I kept running into the problem of big floppy straps that are great for keeping an actual purse on your shoulder but don't look as cute/pretty when you're dealing with something intended for artistic display. Not only did I not like the aesthetics of the straps...glittering big floppy straps was like trying to get an even coating of glitter on a snake. I hate to take them off entirely, because a handle makes for such a pretty purse silhouette. I tried cutting them shorter, and that was a little better, but then I opted to try just cutting them off and totally replacing them. I needed something light for the straps so they'd stay up on their own and hold a pretty silhouette (no sagging allowed), so I tried these little glitter foam balls I had in my stash threaded onto pipe cleaner and LOVED the result! I did a little fine-tuning and experimenting and researching sources, but I am finally at long last ready to share details that I hope will be useful. I have two methods for doing foam ball straps, I will discuss both (and where to get the materials) below. STEP 1 - Get some balls! Factory Direct Craft has some pretty excellent options for glittered foam balls, specifically garlands and the somewhat unfortunately named "ball sprays." The garlands are awesome because they're a good price and already have holes in them, but only come in two colors: platinum and red. The platinum is really pretty - the mix of silver and gold reminds me of vintage mercury glass. The ball sprays come in more colors (including white which is a great base color if you're planning to layer an iridescent sheer/pastel glitter over it), but at 6 for $1, this is one of the pricier options included here. I bought a few shades of Christmas Central decoration glitter balls via Walmart,com. These are pretty similar size (diameters range 0.8-1.25") and price-wise (about $6 for a bag of ~60) as the bags from Michael's. I found the quality a little uneven: the white ones had hardly any glitter on them, but were fine for layering over. Everything else I tried was beautiful and there are a lot of cool color options (I especially love the lake green, gunmetal silver and bright yellow shown here). I had a good experience shopping with The Blushing Iris Etsy Shop. The bags include are a wider range of sizes than the other options I've listed (about 100 little ~0.5" balls and 100 larger ~0.8" balls). The other thing you need is pipe cleaner. You can buy them in packs from craft stores, but I also like to use the garland spools from Factory Direct Craft because I don't have to twist two together to make a longer handle, I can just cut whatever length I need. I would get the metallic ones and try to generally match the color of the balls you're using so if a little peeks out of your handle it's camouflaged. If your balls aren't garland (i.e. vase filler or picks removed from their wires), you make a hole through the middle with a tooth pick. The foam balls are soft, so it should be easy to poke through. 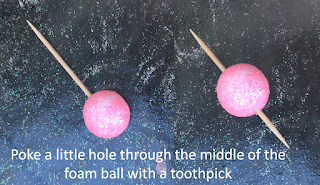 Tip: if you're using ball that have been removed from wires, try to line the toothpick up with the spot where the wire was attached, otherwise you'll have a wee ball spot where there's no glitter. Step 1. 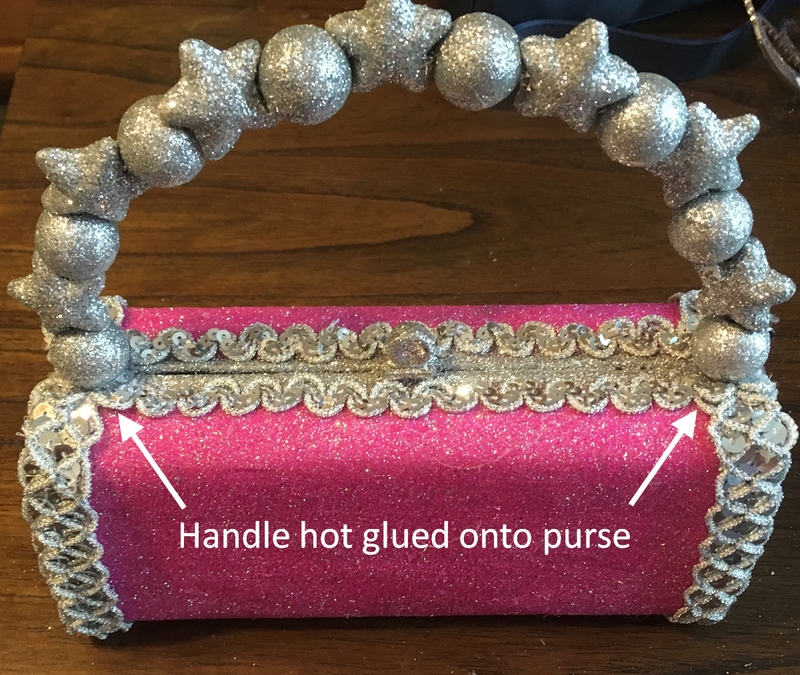 Punch holes in the purse where you'd like your handles to go. If it's like a bucket-shape purse sometimes you only need one hole, but on purses where it's a flap that comes over the top you may need two. I have a tool I inherited for putting wee holes in fabric for setting grommets (grommet pliers, that I would assume were purchased at Joann's) but you probably don't want to buy one just for this....you can also poke holes with little scissors or cut very small incisions with an Exacto knife. Step 2. 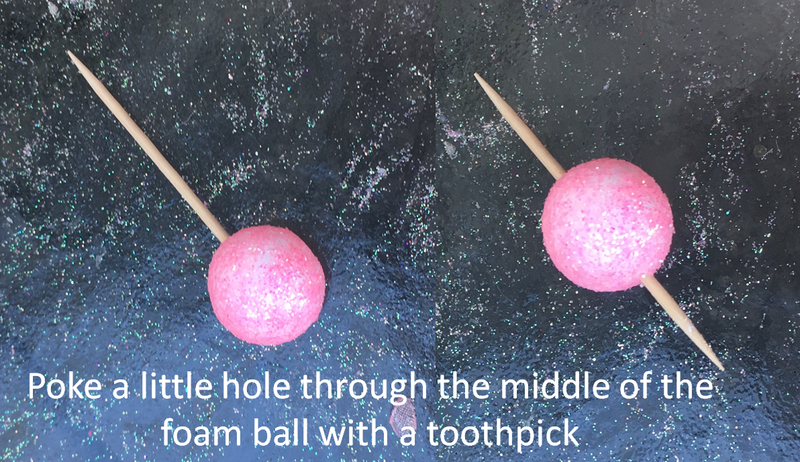 Thread the foam ball with the hole in it onto the pipe cleaner, all the way to the end covered the twisted together end. Covering the twisted ends will prevent any untwisting/unraveling and will cover the pipe cleaner. Step 5. Once your purse handle reaches the desired length, it's time to attach the other side of the strap to the other side of the purse. Voila! Super cute new handle on your purse!! 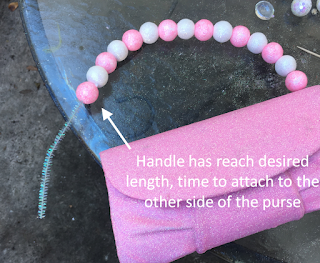 The other way to add a foam ball handle is a little easier, and if you have a purse that doesn't have a good spot for punching holes you can still use this approach. Step 3. 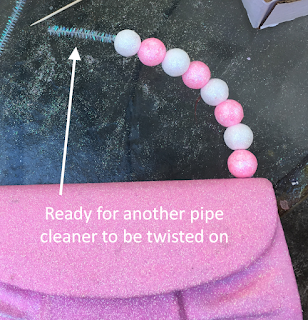 Add a little bit of hot glue inside the end balls and slide them back onto the ends of the pipe cleaner. The hot glue should get a really nice grip on the foam and the bristles of the pipe cleaner. Be careful - the hot glue might melt the foam a little, and I wouldn't want anyone to get burned! Step 4. Hot glue the strap onto the purse. When the hot glue is dry, if there's a lot of it visible where you stuck the handles on, you can cover it with glue and glitter. So there you have it! Two ways of making new purse straps with glitter foam balls and pipe cleaner! I'm going to do an addendum to this post talking about some other ways you can play with this technique, but for now I wanted to mention just a few more things. (1) A teeny little bit of marabou trim wrapped around the base of the purse handle looks really cute and can cover up the spots where the handle attached in case you aren't thrilled with how it came out. (2) Foam balls also make great "feet" for purses that won't stand up on their own. I like to make sure a purse can stand up for display purposes, so I like to add either foam balls or glass stones for feet. If you have questions/ideas, let me know if the comments!! Happy glittering!! Love that chicken from Popeyes!! Last year a friend pointed out that there hadn't ever been a Popeyes Fried Chicken shoe and I had to agree that was a shame - what Carnival season is complete without a box? It was too close to the parade last year for me to do anything with it for 2016, but I threw it in my big, groaning folder of ideas to revisit. I recently got the awesome news that I'd be riding as a sub again in 2017 (WOOHOO!) and we're approx. halfway to Carnival 2017, so no time like the present to get cracking. If you don't have a d'Etat bone in your Carnival haul, I don't think it would be too hard to paper mache one (Google "paper mache bone," there are a ton of tutorials online). If you'd rather use a plastic one, you could keep an eye out once Halloween costumes hit the shelves - I sometimes see them being sold as props for cavemen costume (like this one here). Or if you're already placing an order with an online costume supplier for Halloween or something else (i.e. if you're already paying for shipping), maybe check and see if they have one. 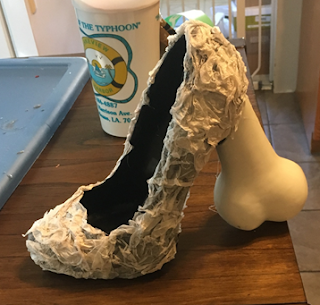 After I hot glued the bone on the heel, I took some scrunched up tissue paper and lightly hot glued that all over the shoe to give it that crinkly chicken skin effect. A coat of mod podge over the whole surface helped sort of decoupage this tissue it onto the shoe wherever the hot glue wasn't holding it down. I mixed up a blend of glitter similar to what I used for the Fried Shrimp Poboy Flip Flop: mostly chunky copper glitter and fine copper glitter, with a little very fine dark red glitter, fine gold glitter, chunky red glitter and just a teeny bit of fine black glitter. If you use any chunky glitter or chunky glitter blends, remember to really aggressively brush off loose glitter after each layer dries because it doesn't adhere as well to the glue and shedding is the enemy. 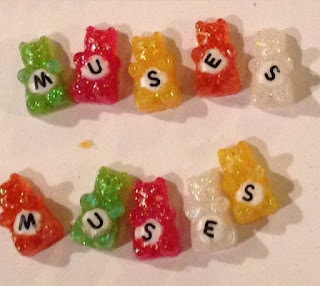 Next up: a Popeyes logo and "Muses 2017." Happy glittering everyone!! 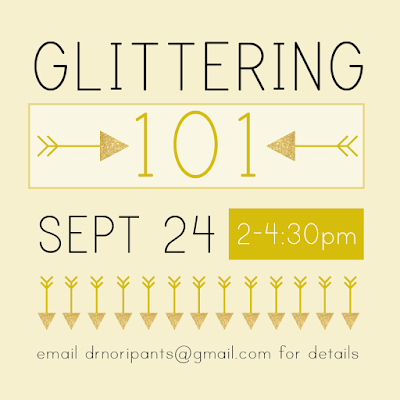 Date set for the September Glittering 101 Workshop! I CAN'T WAIT!! The workshop will be 2.5 hrs long (2-4:30 pm) on Saturday Sept. 12th. We're going to cover the basics of glittering shoes, including covering shoes with glitter, using the transfer technique for "glettering" (glittered lettering) and various types of embellishment. We'll cover the whole process start to finish, but I'll provide shoes at staggered stages of completeness so we don't have to wait for glue to dry between steps. At the end of the workshop, you'll leave with some partially completed shoes, at least one completely finished ready-to-throw shoe, and some extra materials for finishing up your partial shoes at your leisure. The workshop fee also includes a 23 page packet of useful write-ups (including a detailed step-by-step guide to glittering shoes with photos at each step, all the tips and tricks I've picked up in 5 years of shoe glittering, a guide of useful resources, etc.). Everything you need will be provided - you only need to sign up, pay up and show up!! I originally assumed it would only be useful for beginners, but we've had a range of experience levels attend and enjoy themselves (from total newbies to experts). My primary area of expertise is of course glittering shoes, but I can provide customized workshop materials for ladies who ride in other krewes. Just let me know who you roll with/what your preferred throw is when you email me. 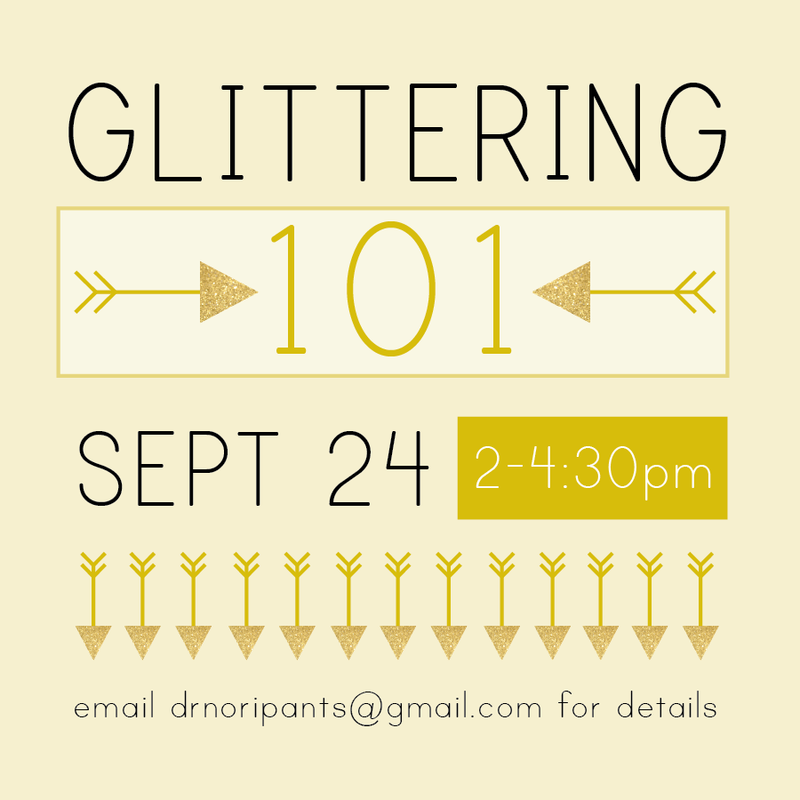 If you're not a krewe member but would like to beef up your glittering skills, you are also welcome to join us! Feedback and pictures from past workshops to give you a little taste of what's in store can be found HERE and HERE. If you're interested or have any questions, drop me an email at drnoripants at gmail dot com and I can give you more info (including pricing)! The weekend has arrived, and I'm hoping that means a little time to set up my new glitterage here and get to creating! Before my little one wakes up and seizes the day with both hands toddler-style, I thought I'd update here right quick. So, I don't actually like the Monster High dolls themselves (as this Dad put it: "it's like someone at Mattel held up a market research study and screamed 'our Barbie dolls aren't causing as much body dysmorphia in children as they used to!' and then made Monster High dolls to "fix" that problem). Anyways, while the execution is a little problematic, I do love the concept (a glamorous high-fashion take on Goth/classic Horror tropes), and this Buzzfeed list turned me onto how unbelievably fabulous and creative the shoe design for the dolls is. I've started a Pinterest board of Monster High (and Ever after High) Shoes HERE, so if you're ever looking for wild shoe designs to get your creative juices flowing, have a peak (if you missed it, I shared some designers/artists whose work is great inspiration in this post). We are finally at long last moved to NOLA and I am very very excited, though also very very tired of unpacking boxes. I am desperate to get back to glittering. Alas setting up my new workspace is somewhat low priority at the moment, but I have a ton of ideas swirling around in my brain and I can't wait to get them into actual 3D shoe form!! I have high hopes for a smidge of sparkle time this weekend. And of course I need to start planning more workshops in the fall when it cools off a bit. First up - my first "official" 2017 shoe - Rhinestone Cowgirl! A friend of a friend gifted me a bunch of awesome Cowgirl boots to glitterify, and I've been loving working with a slightly different shoe shape. I did a vintage Mardi Grad color scheme on this first one. The boot had elaborate stitching that I didn't want to lose, so first step I covered the boot with translucent white sheer glitter (Gary's glitter by the pound, HOLLA). Then I did the other areas of the boots (heel, trim, sole, toe, etc.) in solid opaque glitter (all Martha Stewart, but I'd have to double check the exact colors). Then I traced the stitched in design with crystal puff paint and added a gradient of gold to green to purple. The gradient is essentially five colors of glitter: gold, then 50-50 gold and green, then green, then 50-50 green and purple and finally purple. I just shook stripes over the wet puff paint and voila - Carnival fabulousness!! I added some white feathers with gold tinsel up top, and some aurora borealis rhinestones which were added post-pictures. The bananas are baked and painted polymer clay and the snoball itself is a foam ball glittered with Martha Stewart "lemondrop." The gooey caramel loveliness is represented by tons of drippy gold glitter paint (Tulips 3D Scribbles, my go-to for glettering transfers). The cup is a plastic Mardi Gras cup covered first with a layer of opaque teal (I want to say Gary's glitter by the pound), then followed up with a layer of iridescent sheer (Martha Stewart "blueberry slush"). Sidebar: I picked up a bunch of sale Martha Stewart glitter at Michael's a while back and now it seems it's been discontinued there...anyone know what's up? Are they no-longer carrying it, or revamping the line or what? I love the effect of layering iridescent over opaque like this - such a rich depth of color! The interior is the same effect: opaque magenta with iridescent sheer hot pink over it, this time Recollections. Gold trim from Joann's around the edges and criss-crossed "straps" made from faux little white spoons (actually craft foam stiffened with plastic sheets, then glittered with sheer white glitter from Gary's). I will have to blog about using plastic in combination with craft foam another time, but it has been a game changer for me in terms of allowing my to just build whatever I want from scratch. As usual, there are things I'd do differently on it if I had a time machine, but overall I love how this shoe is turning out. The cup needs a lot of embellishment since I love that color blue but it's pretty plain at the moment - I'm leaning towards a riff on the 75th Anniversary cup design, but replacing the numbers with 17th or 18th because it'll be thrown in 2017 or 2018, Muses 17th or 18th year of rolling. Lots more to come on those, including detailed instructions for making them yourself (it's super easy, you just need the right supplies). More soon - Happy Glittering! FAQ - HOW DO YOU DO THE LETTERING ON YOUR SHOES?